Features: The Aston is compact, lightweight and portable, ideal for use in the home, office or on the go. With its non-slip pads, charging light and protection circuitry it provides you with the latest in charging technology. Simply connect the charger to any 5 Volt (DC) power source and place your phone onto the pad to start charging. 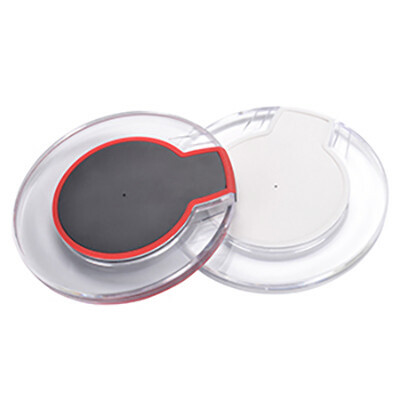 Compatible with any smart phone meeting the Qi wireless charging standard (e.g. iPhone 8, iPhone X, Samsung S8). Includes micro USB charge cable and user manual. Material: ABS, Acrylic.. Certification: CE, FCC, RoHS, Qi Compatible V1.0/V1.1. Product Colour: Black/Red, White/White. Product Size: 99 x 10 mm. Print Process: Pad Print, 4CP Direct Digital. Delivery: 2-4 weeks (indent) from art approval. Standard Packaging: White Box. Packing Details: 100 pcs per carton, 17 Kgs, 50x29x37 cms. Setups: Included.